Saint Peter’s Guest House’s rooms (Michelangelo-Bernini-Borromini-Bramante-Raffaello and San Pietro) have borrowed their names from the most important artists that made Rome immortal. Our rooms with a view are sunny and finely furnished. We carefully selected material and furniture, because we think that the quality of sleep is very important for a good stay. Modern design is the main feature of our rooms: each of them has its private bathroom, heating system and air-conditioned. We think our guests need attention in order to feel they are welcome as they are far from home. That’s why we want to make their stay a nice experience to live. We want them to enjoy Rome. We offer information about art-exhibitions, museums, shows at the Auditorium Parco della Musica, as well as bookings for the most important events in Rome. We organize guided tours around Rome and its neighbourhood (Castelli Romani and their lakes, Castelgandolfo the Pope’s residence . 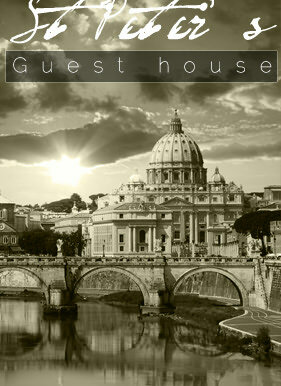 . .) and we particularly recommend the night tour of the Eternal City.